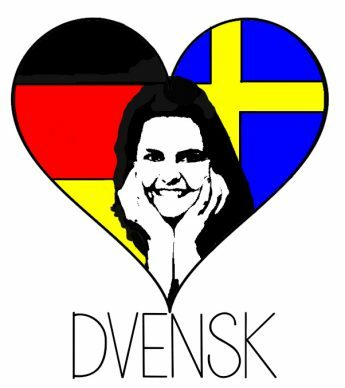 Somehow it is almost a tradition now that I have some kind of emotional meltdown shortly before Midsummer. Luckily, it is also a tradition that I miracously manage to pick up courage just in time for the celebrations. This year was my second Hamburg Midsummer and let me tell you, I think it takes a lot of pressure away from this sancrosanct holiday when you are not in Sweden. As a choir member, I fulfilled my duty of singing the traditional summer songs (which I hold very dear) at the Midsummer pole that the church put up. Actually, I always wonder what the bystanders in the street think of us when we carry the pole to the meadow next to the church. 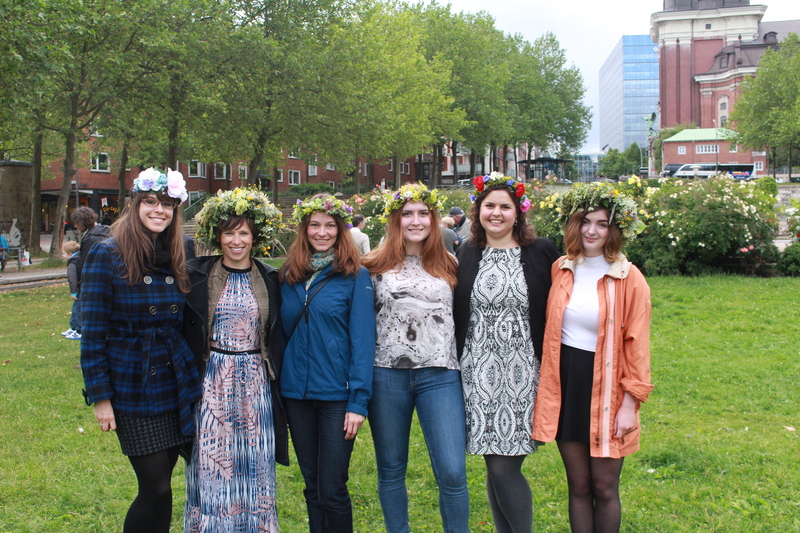 Probably the believe we are some kind of curious sect processing to the pole with flowers in our hair. Then, we all offer to the Midsummer Pole God by throwing all our backpacks and handbags at the foot of the pole. After the offering, we do ritual dances following a clear pattern that everyone in the sect knows but which must look utterly outlandish to the onlooker: The dancers perform gestures such as doing laundry, scrubbing floors and pretending to be a sleeping bear to placate the Midsummer Pole God. 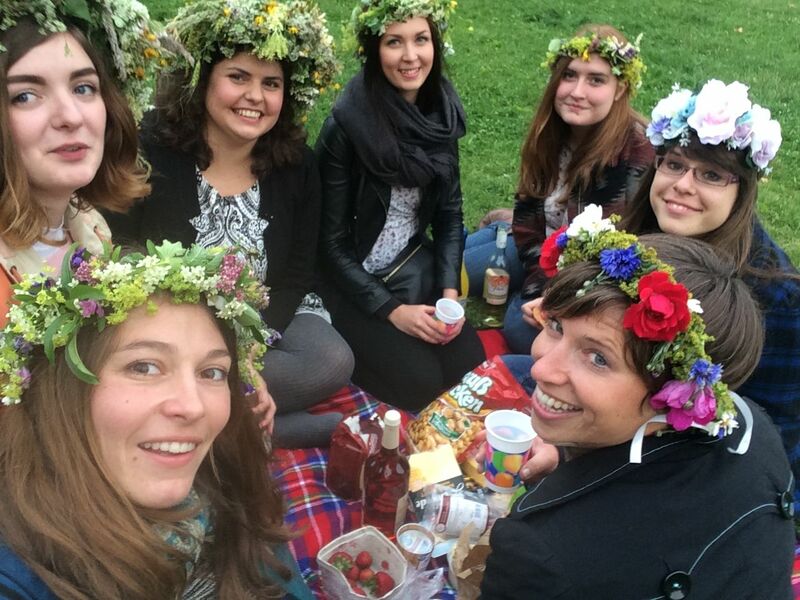 Afterwards, I lead the “Reisegruppe Sonnenschein” [Sunshine Travel Group] as I called my group of Swedish-German ladies to a short picknick before the rain forced us to retreat to my living room where we, still graced by flower wreaths, sung Swedish schlager songs. A funny thing I observed was that no one on the metro was staring at me and my headdress. 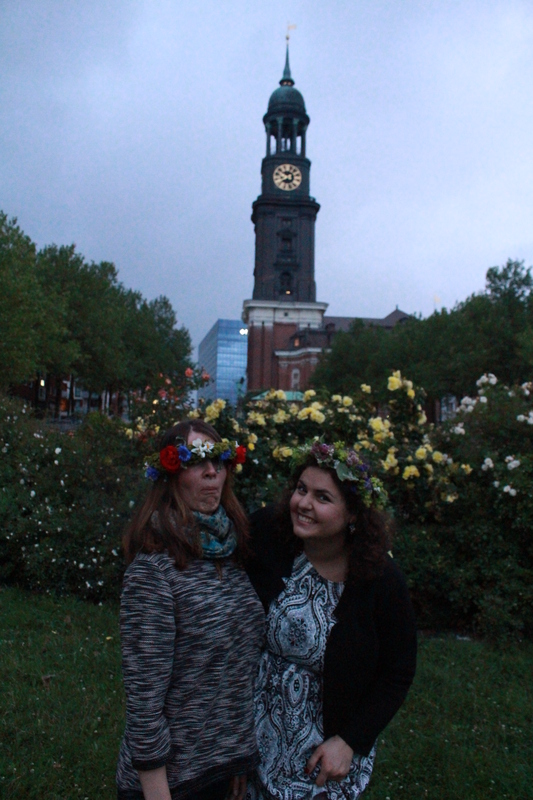 Usually, people in Hamburg stare for any reason (like you speaking English to each other), but apparently my flower wreath looked so natural on me that it did not jar the passengers’ eyes. 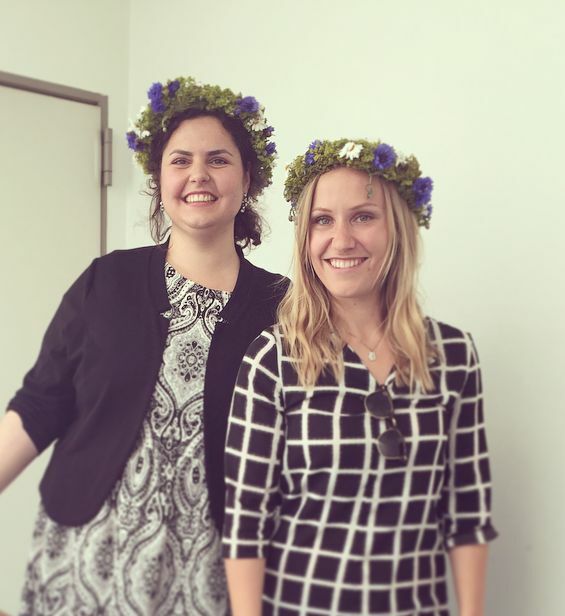 Midsummer is like a second New Year’s Eve, a holiday often charged with expectations that mostly cannot be met . But when you aren’t even in the authentic Swedish environment, that stress is somehow reduced and a picknick with Gille cookies and Pågen bread is a perfectly good enough, relaxed Midsummmer’s Eve. Today, I got to meet Ingrid’s parents for the first time! Ingrid’s mom took this photo of us.